They always carry a contract. If they intend to avenge a theft, the contract will identify the victim; if the crime is murder, it will come from a relative of the victim. Hired thugs will always wear a set of leveled heavy armor, including the cuirass, a pair of boots, a 50% chance of a pair of gauntlets, and a 50% chance of a helmet (all up to steel plate in quality). They will always carry a leveled dagger (up to elven in quality), a leveled heavy shield (up to ebony in quality), and 50-250 gold, dependent on level. 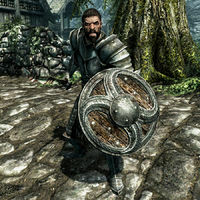 In addition, they will carry either a leveled two-handed weapon or a leveled one-handed weapon plus an additional leveled heavy shield (all up to ebony in quality). Hired thugs who witness you killing a dragon in or near a town will become non-hostile members of the admiring crowd. Once you leave their presence, however, they will resume their pursuit. If other enemies are present, they will fight them off, but will continue pursuing if you flee. Hired thugs can find you even if you are in sneak mode. However, if you see the thugs before they have a chance to confront you and hit one of them with a ranged weapon, only the thug you hit will become hostile, allowing you to deal with them one at a time. The three hired thugs used in Revenge, Hired Thugs all have the base ID 00035B5E. Steal, Thugs hunt player uses one hired thug of each base ID on this page. The hired thug with the base ID 000D783C has the unique dialogue line: "This'll teach you not to take things that don't belong to you!" The hired thug with the base ID 000D783B has the unique dialogue line: "We're here to teach you a lesson." Although the thugs will follow you into buildings, such as stores, they will not follow you into walled cities or dungeons. If the thugs prove too much for you, you can stay in walled cities and wait until you level up. alternatively, you can stay on horseback outside of walls, but once you get off of the horse they immediately become hostile and attack.